Designed with a traditional style and strong build, this vanity is a perfect choice for any bathroom. Its white marble counter and white solid wood base are very easy on the eyes. It comes with a double-door cabinet and drawers for even more room to keep items. This set from Wyndham Collection is great for anyone looking for great style and function in their bathroom. 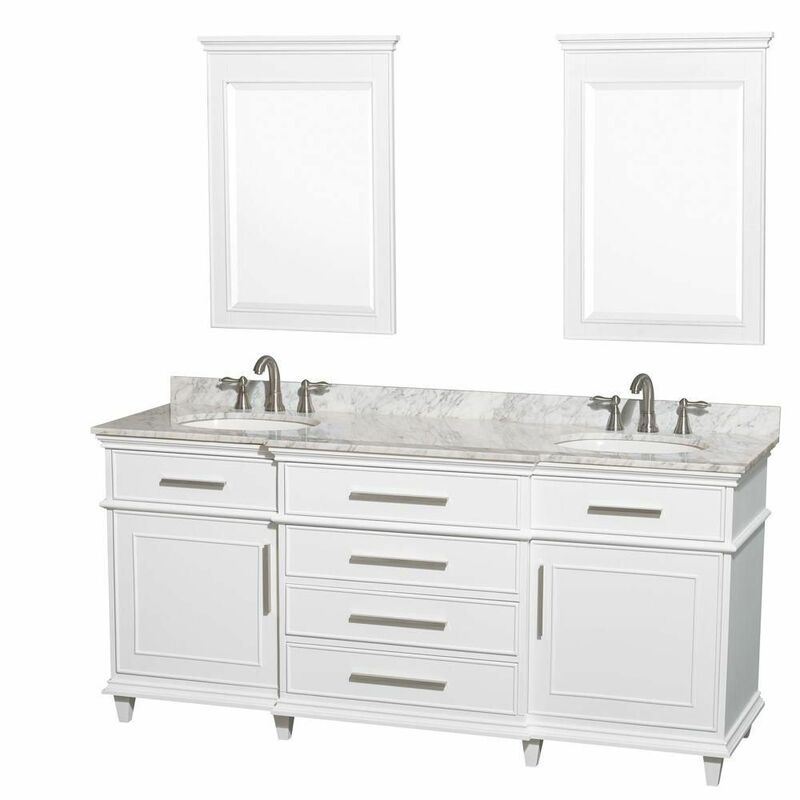 Berkeley 72-inch W 4-Drawer 2-Door Vanity in White With Marble Top in White, 2 Basins With Mirror Designed with a traditional style and strong build, this vanity is a perfect choice for any bathroom. Its white marble counter and white solid wood base are very easy on the eyes. It comes with a double-door cabinet and drawers for even more room to keep items. This set from Wyndham Collection is great for anyone looking for great style and function in their bathroom. Berkeley 72-inch W 4-Drawer 2-Door Vanity in White With Marble Top in White, 2 Basins With Mirror is rated 5.0 out of 5 by 2. Rated 5 out of 5 by HomeDepotCustomer from So far so good. This came safely packaged with all... So far so good. This came safely packaged with all parts entact. Love love the middle drawers. We also ordered the matching mirror We put this in our master bath. The plumber hasn’t hooked everything up yet but I can already see how beautiful this is going to look. Definitely recommend this vanity. Rated 5 out of 5 by nursing04 from Love love love this vanity! It delivered packaged well in a crate and wrapped so nothing was brok... Love love love this vanity! It delivered packaged well in a crate and wrapped so nothing was broken. It is reasonably priced and looks super expensive. The drawers don't close unless pushed though but regardless we love it!